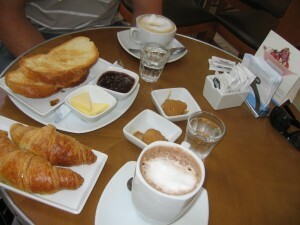 Breakfast in Buenos Aires is light and relaxed. There’s no rush. Take your time. Read the paper — most cafes provide them. And best of all, enjoy excellent espresso-style coffee. Maybe it’s because they dine so late at night. Or perhaps they are watching their wallet or waistline. Whatever the reason, seldom do Porteños start the day with a heavy meal. Forget about omelettes, sausages, bacon and pancakes. Instead, expect medialunas and tostadas. Medialunas are reason enough to visit Buenos Aires. Similar to a croissant, they come in two forms: sweet (dulce) or not sweet (de grasa). I’ve seen more than one tourist become addicted to them. Tostadas are slices of toasted baquette, usually served in a basket with peach or berry jam, butter and spreadable cheese. It seems there’s a cafe on every corner of the city and I’m sure every one serves coffee, medialunas and tostadas. Coffee comes in a variety of forms but cafe con leche is commonly ordered. It’s delicious espresso coffee with steamed milk. If you want stronger coffee with less milk, ask for un cortado. Often a small glass of fresh squeezed orange juice and a glass of mineral water will accompany the food and coffee at no extra charge. Expect to pay between 8 and 15 pesos (USD$2.50 to $4.50) for a typical Buenos Aires breakfast. Yes, there is a Starbucks in the Alto Palermo mall. It’s on Coronel Diaz close to Santa Fe.